Obituary for John Michael "Jack " Hodges, Jr.
John (Jack) Michael Hodges, Jr.
Jack Hodges passed away peacefully at his home on Herring Creek surrounded by his loved ones on April 2, 2019. Jack was the son of the late John and Rosine Hodges. He was preceded in death by his son-in-law, Chuck Downs. He was the loving father to Marie Hodges McCrossen, Missy Hodges, Rosine Hodges Downs, and Jackie Hodges Dvorak and the proud grandfather to Edward McCrossen, Sarah Dvorak and Brett Dvorak. He is survived by his endearing friend and devoted companion, Triggie Draper. He is also survived by his sisters, Kay Owens, Virginia Hodges Diehm, Beth Freeman and Linda Tincher. Jack was a farmer’s son and grew up on Hatchet Thicket Rd, attended Holy Angels School and served as an altar boy at Holy Angels Church. Later in his childhood the family farm grew, acquiring a large tract of land on Herring Creek in Valley Lee, MD. Jack attended Mount St. Joseph’s High School in Baltimore, MD and was always excited for those weekend train rides that brought him back home to family, friends and chores on the farm. Jack was a special kind of man growing up with four sisters and then raising four daughters. He always gave of his “time”. His patience, wisdom and unyielding ability to listen were those strengths that made him such a great father. Jack loved his dog Pearle and found pleasure in his daily walks with her along Hodges Lane. His daily walks served to strengthen his faith and deepen his relationship with his Lord and Savior Jesus Christ. His personality spoke for himself. 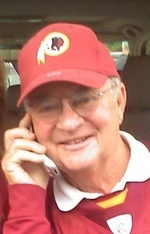 Many will remember his fun-loving spirit including summer days boating on the water, watching NASCAR, cheering on the Washington Redskins, and especially kicking off the Baltimore Orioles’ Opening Day. Jack was a colorful story teller and those close to him will cherish those memories of enjoying a cold drink while sitting on the porch looking out on Herring Creek. At Jack’s request there will be no Funeral Service. However, masses may be offered for him at St. George Catholic Church in Valley Lee, MD. Arrangements provided by the Mattingley-Gardiner Funeral Home, P.A. Leonardtown, MD. To send flowers to the family of John Michael "Jack " Hodges, Jr. , please visit our Heartfelt Sympathies Store.